You may print it out and mail it back to us, or you can cut and paste it into an email. ODPS will sell retail to customers who don't have a dealer near by. Our retail price will be slightly higher so as not to undercut our Dealers. Go to your Dealer with the address of this web-site and encourage them to contact us! He can then sell you a Cam Saver at a good retail price. But until then, you may order your Cam Saver direct from Old Dominion Pro Shops at a Price of $11.99 each, plus shipping and handling. Virginia Residents need to add 5% sales tax. Just click here ODPS and email us your order. We accept Money Orders, Cashiers Checks or you can pay securely with Pay Pal. Cam Saver is a flexible device made from neoprene and comes in three designs (pictured, left to right): Advantage, Black, and Advantage Timber. 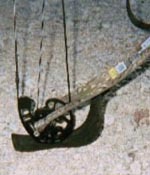 Cam Saver, which is about 2½ inches wide and 10½ inches long, attaches and detaches (with VelcroTM) to the lower limb of a bow. "This is a very needed product." "We believe you have a winner!" With Cam Saver there are no more sore toes! How many times have you rested your bow on your boot to get a break only to end up with sore toes. We do not recommend hunting in sandals, but you could! 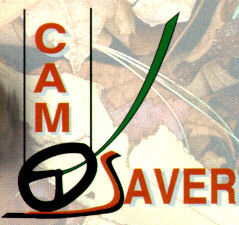 Cam Saver is also ideal for hunting on the ground. 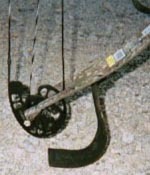 Whether in a ground blind or turkey hunting with your back against a tree, you will be free to set your bow on the ground and move as many times as you like to stay in shooting position without worry of getting mud, sticks, leaves, etc., in your cam or string. In no way will a Cam Saver change the speed or point of impact of your arrow!!! You'll never know its there when you shoot your bow!!... That is, untill you get ready to set your bow down and pull your arrows. Once you use a Cam Saver you'll never want to be without one. Just like your favorite hunting knife, it will become required equipment from that day forward. Find a tree or post near where you want to set your bow down. 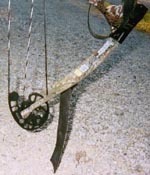 Set your bow on the Cam Saver and next to the tree or post. 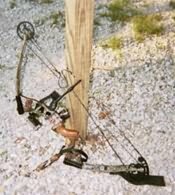 Tilt your bow forward until the stabilizer touches the ground. Now lean the bow over until it rests against the pole or tree. This works great while removing arrows from targets, especially on the 3-D range. PayPal is a free online service that allows anyone to securely make payments and accept payments online with or without a major credit card. If you don't already have a PayPal account and would like to place an order, just click the "BUY NOW" button anyway and give them your information. They'll have you set up and ready to roll in a matter of minutes. It's a great little service. We also accept Money Orders, Cashier Checks and Personal checks. (Please allow up to 10 days for your personal check to clear before we ship) Just email us with your order. Its that simple.